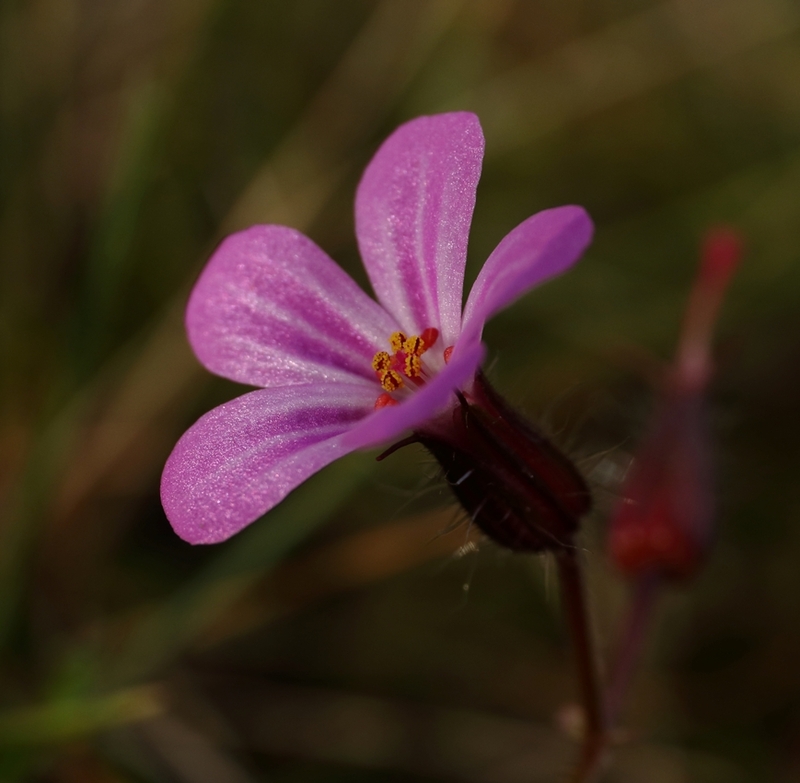 Herb Robert Geranium robertianum is one of the overlooked gems of the Assynt flora, being small and preferring shady habitats. These pictures, taken by David Haines near Oldany on 19th June and 30th September 2017, illustrate its distinctive characters: a sprawling habit; ternate leaves, with the three leaflets further sub-divided; five-petalled pink flowers, with delicately-striped petals; orange anthers; hairy sepals (as other parts of the plant), and the long, pointed, five-sided fruits, which split and roll up to discharge the seeds. The fruits explain the generic name Geranium, from the Greek geranos, a crane. 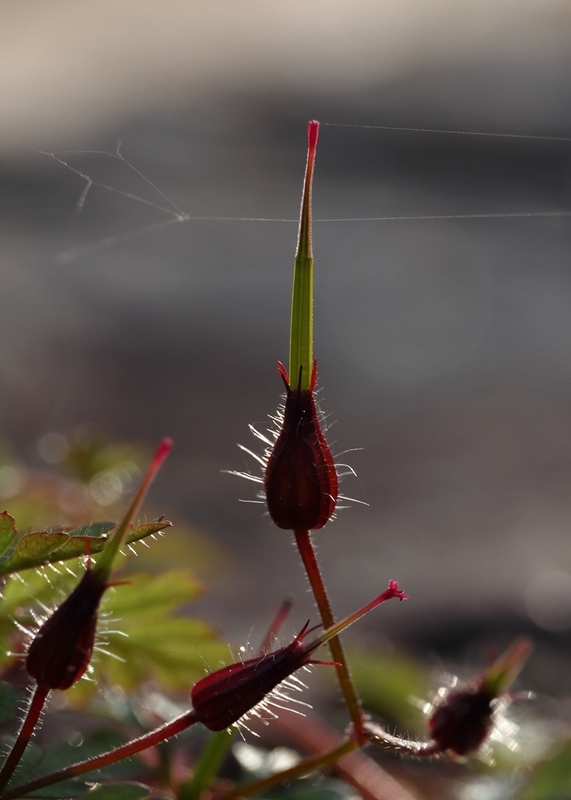 Herb Robert has its own vernacular name, but its relatives are all known as crane’s-bills. Only two other species of Geranium grow wild in Assynt, both fairly scarce and usually coastal, dove’s-foot crane’s-bill G. molle and cut-leaved crane’s-bill G. dissectum. We also have common stork’s-bill Erodium cicutarium, which with us is a rare flower of sandy areas. Cultivated geraniums, incidentally, are something quite else, frost-sensitive members of the genus Pelargonium hailing from South Africa. 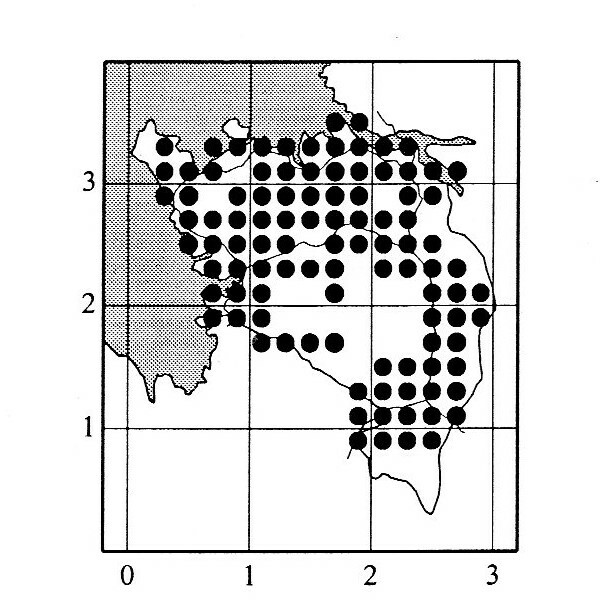 Herb Robert is found throughout most of the parish, except on the highest ground (see attached distribution map from the Flora of Assynt). Being shade-tolerant it occurs in woodland, gorges, boulder scree and occasionally in shore-line shingle and around buildings. It has a long flowering season, from May through to October. 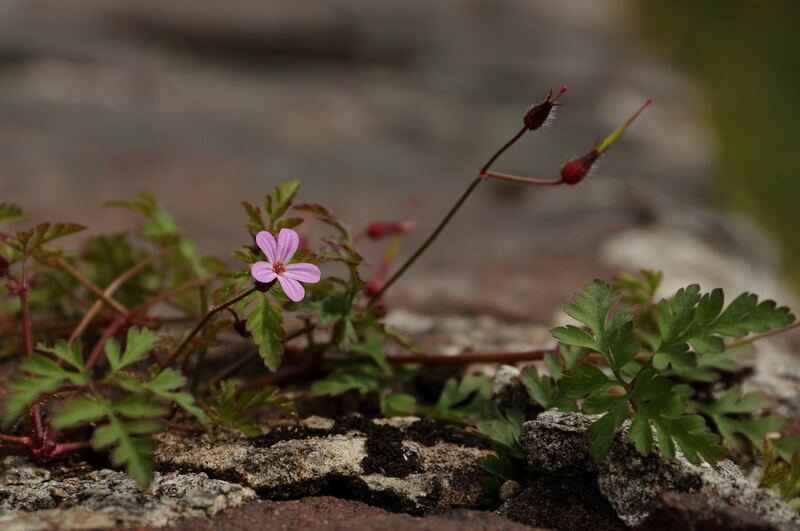 Herb Robert was well known to earlier generations of Highlanders, being a ‘very popular remedy’ for all sorts of skin conditions, hence the Gaelic name lus an eallain, meaning a plant for hives. Another name was righeal cuil, implying powers as an insect repellent; this may relate to the ‘strong, disagreeable smell’ of its leaves, referred to even less flatteringly in Richard Mabey’s Flora Brittanica as ‘an acrid mouse stench’.